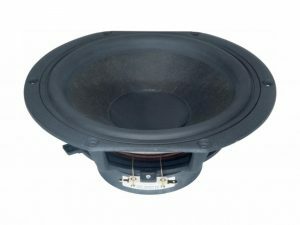 The SDS compact subwoofer family offers low resonant frequency performance, ideally suited for compact sealed enclosures. 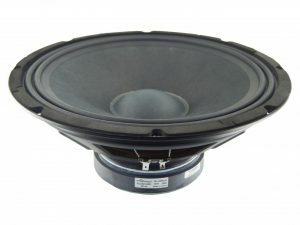 This 5.25 inch 8 ohm member of the SDS family offer a coated paper cone with rubber surround, a high power voice coil suspended in a ferrite magnet motor, and a narrow-profile steel basket, shaped to fit into narrow cabinets. 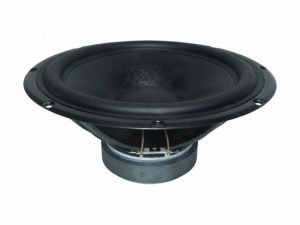 The SDS compact subwoofer family offers low resonant frequency performance, ideally suited for compact sealed enclosures. 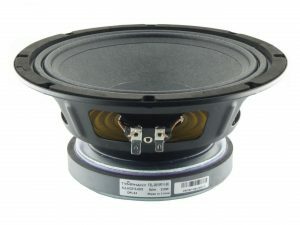 This 6.5 inch 8 ohm member of the SDS family offer a coated paper cone with rubber surround, a high power voice coil suspended in a ferrite magnet motor, and a narrow-profile steel basket, shaped to fit into narrow cabinets. The SLS line combines high quality performance with an affordable design. 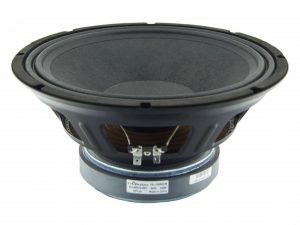 This 10 inch 8 ohm member of the SLS family features a rigid steel basket, a coated paper cone, and a ferrite magnet motor with aluminium shorting ring for improved distortion performance. 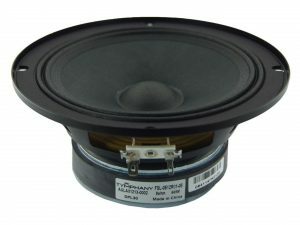 This 8 inch 8 ohm driver is a member of the high performance HDS family. A powerful ferrite magnet system is coupled to a finite element analysis designed suspension system, containing both a linear spider design and a rubber surround. The motor contains an aluminium shorting ring, which reduces coil inductance, thus providing both extended frequency response performance and reduced distortion. 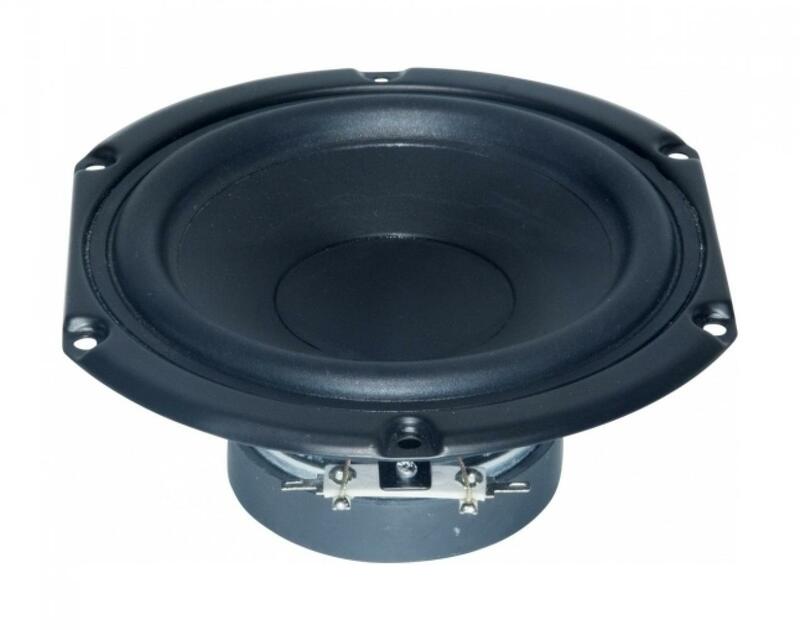 The long-throw voice coil ensures linear high excursion performance, needed for signal clarity. The cone necks are vented so as to reduce air compression effects under high excursion conditions. The cast aluminium basket offers structural rigidity, heat sinking capacity for the motor, and additional air venting under the spider so as to again reduce air compression effects. The cone in this model is nomex based, offering a unique visual and acoustic experience. 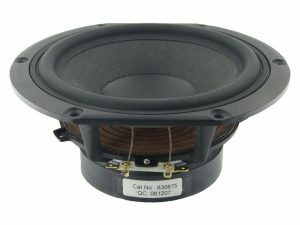 This 6.5 inch 8 ohm driver is a member of the high performance HDS family. A powerful ferrite magnet system is coupled to a finite element analysis designed suspension system, containing both a linear spider design and a rubber surround. The motor contains an aluminium shorting ring, which reduces coil inductance, thus providing both extended frequency response performance and reduced distortion. 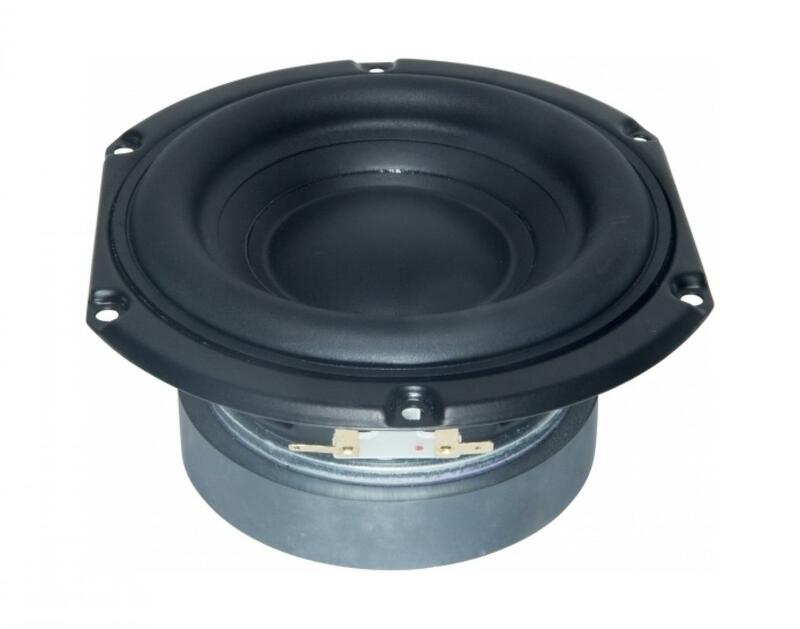 The long-throw voice coil ensures linear high excursion performance, needed for signal clarity. The cone necks are vented so as to reduce air compression effects under high excursion conditions. The cast aluminium basket offers structural rigidity, heat sinking capacity for the motor, and additional air venting under the spider so as to again reduce air compression effects. The cone in this model is nomex based, offering a unique visual and acoustic experience. The SLS line combines high quality performance with an affordable design. 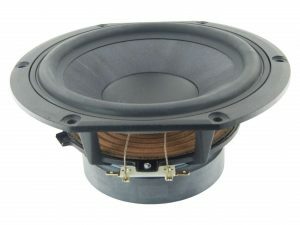 This 6.5 inch 4 ohm member of the SLS family features a rigid steel basket, a paper cone, and a ferrite magnet motor with aluminium shorting ring for improved distortion performance. 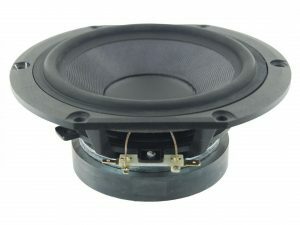 This 6.5 inch 8 ohm driver is a member of the high performance HDS family. A powerful ferrite magnet system is coupled to a finite element analysis designed suspension system, containing both a linear spider design and a rubber surround. The motor contains an aluminium shorting ring, which reduces coil inductance, thus providing both extended frequency response performance and reduced distortion. The long-throw voice coil ensures linear high excursion performance, needed for signal clarity. The cone necks are vented so as to reduce air compression effects under high excursion conditions. The cast aluminium basket offers structural rigidity, heat sinking capacity for the motor, and additional air venting under the spider so as to again reduce air compression effects. The cone in this model is a glass fibre composite, offering a unique visual and acoustic experience. 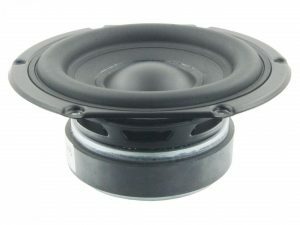 This 5.25 inch 8 ohm driver is a member of the high performance HDS family. A powerful ferrite magnet system is coupled to a finite element analysis designed suspension system, containing both a linear spider design and a rubber surround. The motor contains an aluminium shorting ring, which reduces coil inductance, thus providing both extended frequency response performance and reduced distortion. 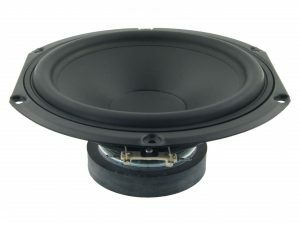 The long-throw voice coil ensures linear high excursion performance, needed for signal clarity. The cone necks are vented so as to reduce air compression effects under high excursion conditions. The cast aluminium basket offers structural rigidity, heat sinking capacity for the motor, and additional air venting under the spider so as to again reduce air compression effects. The cone in this model is a glass fibre composite, offering a unique visual and acoustic experience. 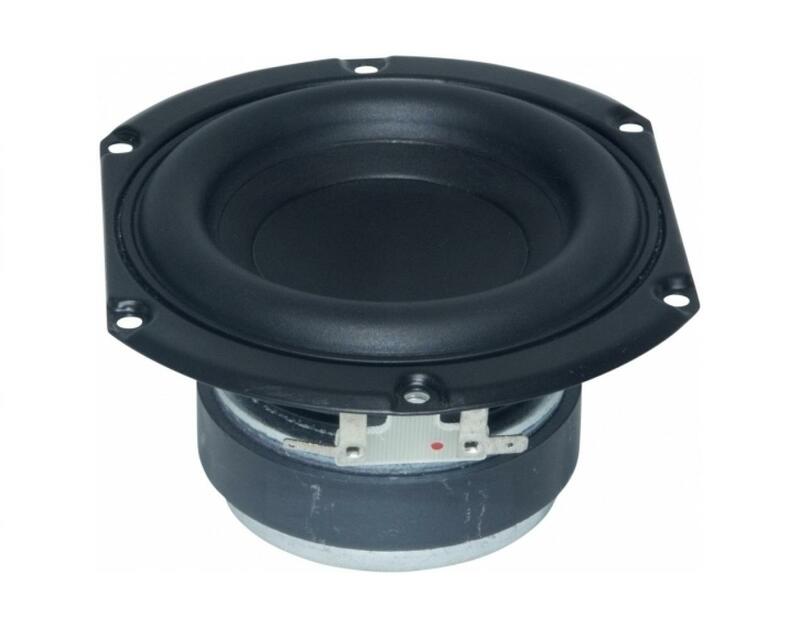 The SDS compact woofer family offers low resonant frequency performance, ideally suited for compact sealed enclosures. 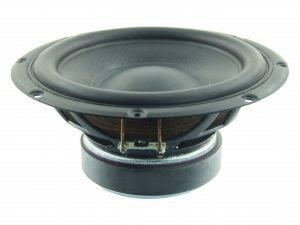 This 4 inch 8 ohm member of the SDS family offer a coated paper cone with rubber surround, a high power voice coil suspended in a ferrite magnet motor, and a narrow-profile steel basket shaped to fit into narrow cabinets. 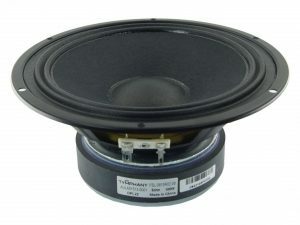 This TC family 3.5 inch 8 ohm full-range driver,with ferrite magnet, paper cone, rubber surround, and plastic basket with front sealing gasket, is designed to be a cost-effective high performance full range driver. The cone utilizes Tymphany-patented PentaCut NRSC cone technology to help dampen and control cone resonances, optimizing the listening experience. The motor contains a copper cap to lower inductance and distortion. The product was designed with portable and compact applications in mind. The SLS line combines high quality performance with an affordable design. 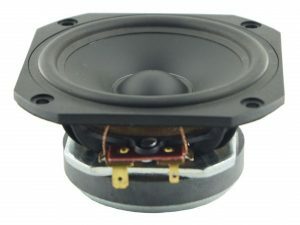 This 5.25 inch 4 ohm member of the SLS family features a rigid steel basket, a paper cone, and a ferrite magnet motor with aluminium shorting ring for improved distortion performance.